I don’t know how to explain my feelings about these cookies without sounding like a crazy person, but here goes. 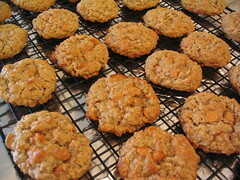 The scotchies are chewy on the inside, crispy on the outside, and actually look like the picture in the cookbook. The problem? The smell. If I don’t like the smell of something, I can’t eat it. Take for example, gingerbread cookies. If they smell anything like molasses, I can’t go near them–the smell of molasses makes me totally nauseous. And while making these cookies, I learned the same goes for butterscotch. As soon as I opened the bag, I knew I was in trouble, and I was counting the minutes until the last batch would be done. My kitchen smelled so bad! However, I know I’m weird, and most likely no one else feels the same way about the smell of butterscotch. So, I will bring these into work and let my coworker guinea pigs tell me what they think about the taste, then will report back. Bake for 7 to 8 minutes for chewy cookies or 9 to 10 minutes for crspy cookies. Cool on baking sheets for 2 minutes; remove to wire racks to cool completely. Recipe from The Baking Bible. The ingredients list of the ‘flavored’ morsels puts me in the same boat as far as butterscotch chips go. As much as I like butterscotch and caramel, I pass on these at the store. Same for the new”swirled” caramel/chocolate chips. I think they taste funky. Kudos for finishing the batch! I bet there will be plenty of takers at work. I think they look great. I too don’t like the smell of butterscotch, but I bet you the taste is fantastic. I know exactly what you mean about molasses. I have to pin my nose with a clip when I mix it into recipes. And while I love butterscotch – I knew exactly what you meant when you described the smell from opening a new bag. Ew. If your co-workers are anything like mine – they’ll love them! Yum. Those look really great. I got 6 bags of various MORSELS in a cooking ingredient basket for Christmas along with with my KitchenAid mixer gift! Yup. The 5 qt. lift model in Empire Red (CostCo model) lives in the fabulous, remodeled kitchen. Too bad the kitchen got ripped up due to a SLAB LEAK that I discovered on New Years Day. At least AAA Insurance is coming through for me big time, and I get a whole new floor. I’ve been looking for a use for butterscotch chips — I am going to try this one! I can only handle the butterscotch chips in certain things, although it’s not much of an issue now because the butterscotch chips are usually processed on the same line as the peanut butter chips so we don’t buy them anymore. I am completely the same way with scents…. and molasses and butterscotch make my stomach churn. Isn’t that funny? Looks like there will be some happy co-workers at the office! I made these recently as well because I used to love them as a kid. Guess what…I hate them. I hate the butterscotch chips with a passion. I wonder if they are different now than they were when I was little? My kids didn’t like them either! By the way, I have a huge thing about smells as well. I ran across this and thought of you. It doesn’t really seem your style, but it’s funny. Every time (well, not EVERY time) I see a KitchenAid mixer I think of how much you love yours. I do admire you for trying. I don’t think I ever made anything I can’t stand the smell of. The cookies look nice though, I might try them replacing the morsels with raisins or chocolate. I’m not sure there even is such a thing a s butterscotch morsels in the UK.